Q In the context of current political developments, how does the JVP plan for its activities? As for the current situation, we find several issues. The economy has virtually collapsed. The govt is embroiled in a serious financial crisis. It is now opting to auction off the national assets of the country as a way out of this crisis. The Hambantota Port and the adjacent lands, the East Terminal of the Colombo Port, the Trincomalee Oil Tank Farm are earmarked for selling off. Apart from the Economic and Technology Co-operation Agreement (ETCA) to be signed, the govt has inked yet another Memorandum of Understanding (MoU) with India outlining projects to be assigned to India. We are not opposed to mutually beneficial bilateral agreements. Yet, we are against such agreements which are disadvantageous to the interests of Sri Lanka. We do not accept the attempts by the govt to make easy money by selling off the national assets. The JVP has initiated a struggle against this. In the meantime, the govt is now trying to repress the public upsurge against it. In one instance, the govt tried to limit protest and demonstrations to a site specified for it. The govt is trying to use force against those protesting against garbage disposal in their localities. Now, we learnt of yet another attempt to create a force to deal with emergency situations to be triggered by strike actions. Then, the democracy is at stake. Though the govt promised to abolish executive presidency, it seems to be abdicating its responsibility in this regard now. For the abolition of executive presidency, we initiated a dialogue with the like-minded parties. We have held talks with Sri Lanka Muslim Congress (SLMC), the Tamil National Alliance (TNA) and with the Communist Party. We intend to have talks with the President soon. Governance, by one party after another since Independence, has failed to address issues of our country. We need a novel form of governance and we will work for it. Q When abolishing executive presidency, there is concern that it would affect the unitary status of the country. It is argued that the loss of Executive President’s hold on the PCs would lead to separatism gradually. How does the JVP see it? It is not a correct argument as we see. Then, the President, the Prime Minister and the other forces that rallied behind to unseat the former rule, should have seen such a danger before. The abolition of executive presidency is a key election pledge. It is not the amendments the executive presidency that was promised. Actually, the executive presidency cannot protect the country from being partitioned. In fact, separatism raised its head when the country was ruled by executive presidency. The country is safe from separatism as long as people are empowered, democracy strengthened and ethnic harmony fostered. We reject claims for retaining executive presidency by trotting out such excuses. Q However, if the executive power in appointing provincial governors is taken out, it will give more independence to the PCs paving way for them to become independent units as argued by some government leaders. How do you see it? If a new Constitution is introduced, a set of provisions will have to be incorporated to prevent the country from being partitioned at any cost. In the present Constitution, there is no provision to take action in case a PC declares independence. We need new constitutional safeguards to prevent the division of the country. It has to be vested with Parliament. Q How does the JVP see eye-to-eye on this issue with the SLMC and the TNA? We have discussed the basic points. There is no broad discussion. This is the best opportunity to work out a new Constitution to strengthen democracy and to ensure people’s rights. All the parties should strive to reach common stand rather than sticking to their guns. Q The JVP, right from its inception, advocated decentralization of administrative power, but not power devolution. Have you deviated from this position in this manner? There is no change in our policy. We are against any move that leads to the division of the country. Yet, we have to ensure equal rights for all citizens to ensure stability of the country. Rather than making way for the partition of the country, we have to decentralize administrative powers to the lowest possible level. We have to work out something in keeping with that fundamental position. At the same time, equal rights should be guaranteed for all. Q How does the JVP subscribe to the Constitution making process in the Steering Committee? We are a party to it. It has discussed matters both acceptable and unacceptable to us. We believe in bilateral talks with the political parties to identify areas with common position. Q There are moves for privatization of national assets as you said earlier. This is against the core of the JVP policy. But, there is public perception that the JVP’s role in thwarting such attempts by the govt are minimal. How do you respond? There are two opinions here. The extremist forces against us accuse us of involving less in this struggle. The govt, on the other hand, accuses us of being oppositional to everything. In reality, and in the past, the JVP stood against the govt’s move to sell out state assets. In fact, we have managed to pre-empt such moves. We launched the biggest protest against the move to lease out 15,000 acres of land in Hambantota for Chinese companies. We led from the front against the project to hand over a stake of the Hambantota Port. The govt backtracked from its position afterwards. The JVP trade unions were at the forefront against the proposals to lease out the Trincomalee Oil Tank Farm. Q How certain are you that the govt would not forge ahead with the signing of agreements to implement its projects in Hambantota and Trincomalee involving China and India? We want the govt to stop it. For that, we will make every possible effort. Actually, the country is going through an acute financial crisis. Our manufacturing base is lost. Q Do you see this as part of Indian expansionism once your party had espoused? This is a policy issue concerning Sri Lanka. We have to look at it that way rather than blaming India. India is actively expanding its trading with the rest of the world. We should also have a policy to get maximum benefit for the country. We should not formulate policies that are in line with other countries. Then, they will have the advantage, not us. We do not have inherent enmity with India otherwise. Q In terms of geopolitics and also from the JVP’s perspective, how detrimental is it for Sri Lanka to have the Hambantota Port leased out to China and Trincomalee Oil Tanks to India? In fact, these are assets connected with national security. These projects cannot be compared with other investments such as garment factories and tea industry. The port is an economic nerve centre with a bearing on national security. Likewise, the Trincomalee Port and the petroleum project will definitely have a bearing, not only on economy but also on national security. Energy sector is the most powerful economic tool connected with national security. It should be kept fully within SL’s control. It should not be alienated. Economic nerve centres should never be alienated to a foreign power. Q The JVP played a pivotal role in installing this govt. How do you compare this regime with its predecessors? It is true that the JVP played a key role and it was accepted by a majority of people as 6.2 million people voted against Mahinda Rajapaksa. It was part of our struggle. The next struggle is to form a progressive govt by defeating the current regime. When compared, we do not see much of a difference between the present and the former regimes in most aspects. Only difference is that this govt is fragile. The former rule had central control. The President, the PM and the Cabinet belonged to the same party at that time. Today, it is different. The President is from one party and the PM from another. As a result, there is no strong decision-making. At the beginning, the govt was less repressive. It is now attempting to suppress dissent against it. The previous govt resorted to privatization, and the current regime does the same too. Both the govts went for borrowings. We find corruption and frauds under both the regimes. However, there is some breathing space in terms of democracy under the new govt. It is also shrinking now. Q Traditionally, there are two main parties that had ruled this country. One could be ousted from power with the support of the other only. Then, how could the JVP form a new govt independent of these two parties? The political situation is building in favour of a different force, as we see. Only the capitalist parties called the shots. When one capitalist party was in power, another capitalist party was the main opposition. Today, both the main parties are in the govt. Then, only the opposition parties can get together to unseat the govt. The MR group cannot attract people again. As a result, the JVP is ready to fill the vacuum. We will make a political formation. It is not a mere political party. It will be a combination of all stakeholders – academics, professionals, artistes and others. Q There is a public perception that the JVP chooses political strategies in a manner that is advantageous to the UNP. Your party tends to criticize the MR faction more aggressively while trying to protect the UNP-led govt. How true it is? It is not true. It is an allegation made by the Rajapaksa gang. We built criticism against the MR rule and it cannot cleanse itself of its past wrongdoings. Alongside, we have logically built criticism against the present rule. Only the JVP exposed the Central Bank Bond scam to the country first. 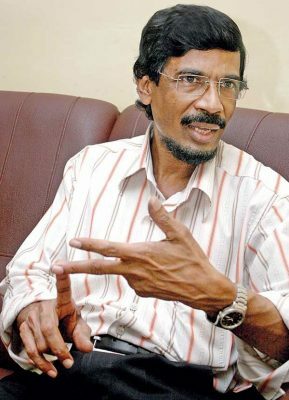 The COPE investigations were done successfully under the chairmanship of JVP MP Sunil Handunnetti. The Joint Opposition moved a ‘No confidence’ motion against Finance Minister Ravi Karunanayake. The JVP also voted for it along with the JO. But MR did not vote. Literally, the MR clan had acted to safeguard the govt, not us, in spite of lashing criticism in public against the incumbent regime.